So begins Morales’ book Indian Woman I Am, a moving and uplifting story of how she overcame devastating life events to become a strong and inspiring woman. We are pleased to host Evelyn as she reads from her book, demonstrates hand drumming, shares her story and answers questions. 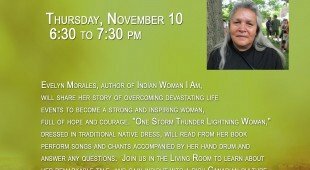 We hope you will join us Thursday, November 10 at 6:30 pm in the Living Room at Central Library to hear her remarkable tale and gain insight into a rich Canadian culture.